Built as a steel hulled schooner rigged fishing vessel by Anciens Chantiers Dubigeon in Nantes for Joseph Briand et Fils, St Servan. 21 March 1934 launched as the COMMANDANT LOUIS RICHARD. Tonnage 858 grt, 372 net, dim. 54.6 (bpp) x 10.1 x 5.24m. One auxiliary 5-cyl 2S CSA oil engine, 83 nhp. Carried 16 dories for fishing. 1934 Delivered to Pècheries du Labrador at Saint Malo. After delivery used as a fishing vessel on the Grand Banks of Newfoundland. 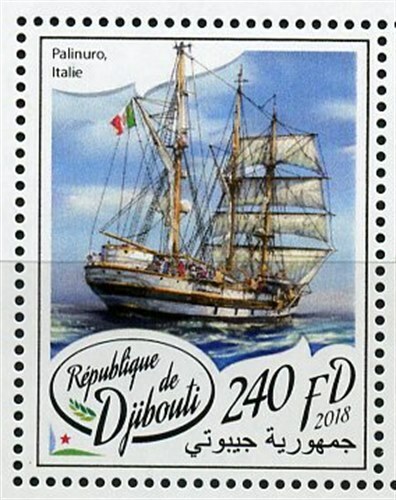 PALINURO is a three-masted, iron-hulled barquentine, active as sail training vessel for the Italian Navy. PALINURO is named after Palinurus the famous helmsman of Aeneas's ship (after the fall of Troy the defeated Trojans detoured the Mediterranean). Palinurus is seen as a prototype of an experienced navigator or guide. Built at the shipyard Anciens Chantiers Dubigeon in Nantes by order of Joseph Briand (together with her sister ship LIEUTENANT RENÉ GUILLON) and named COMMANDANT LOUIS RICHARD, the ship was intended as barquentine. However the building costs of both ships ruined the original customer even before the ships were finished. The new owner Pècheries du Labrador from Saint-Malo finished the ships as schooner to be used for cod fishing. In 1948 COMMANDANT LOUIS RICHARD was bought by shipowner Bonin from Noirmoutier-en-Île, changed to a barquentine and renamed JEAN MARC ALINE to be used for fishing in the Southern Indian Ocean. Eventually this activity became unprofitable, thus the ship was set for sale. In 1951 the Italian Navy was looking for a replacement for the CRISTOFORO COLOMBO (passed to the Soviet Union), bought the vessel and renamed her PALINURO. 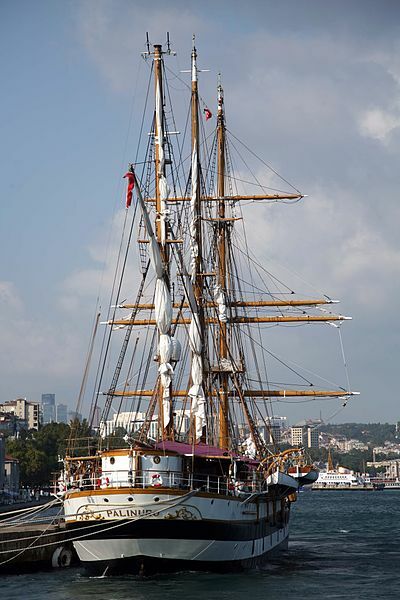 After a complete renovation the ship is used as training vessel for Senior Ratings. Dim. 68.95 x 10.09 x 5.70m, length bpp. 50.00m, draught 4.84m. Now fitted out with a Fiat diesel, 450hp. Crew 5 officers, 12 petty officers, 44 crew and approx. 50 trainees. ITS PALINURO, during the training campaigns, has touched 164 different ports (many more than once), over the course of her history has traveled over 300,000 nautical miles, almost 15 times around the world. ITS PALINURO has gone out 10 times from the Pillars of Hercules (Gibraltar), for five times she has passed the Strait of the Dardanelles (1991, 1993, 2007, 2016, 2018), while twice in her history has entered the Black Sea, crossing the Bosporus Strait (2016, 2018). Only once in its history has it crossed the Corinth Canal, exactly on 22 August 2014. The record for the longest time campaign is up to that of 1987, with a duration of 200 days, from 24 April to 10 November, for a total of 20 visited ports and 6925 miles traveled, but the largest number of miles traveled in only one. The campaign was achieved in 2002, with 12748 miles in 192 days of campaign. The longest navigation, is 290 hours (a bit more than 12 days) with about 1350 miles traveled from Batumi (Georgia) to Argostoli (Kefalonia - Greece), dates back to 2018; while the longest in terms of distance is 2001 with 1473 miles traveled in 10 days from Valencia to La Rochelle. The longest continuous sailing navigation was 150 hours and 12 minutes, during the 54th training campaign of 2018 on the Taranto - Kos route, which also represented the record of sailing hours on a single leg. The campaign with the most sailing hours was the 2018 campaign with over 600 hours. Djibouti 2018 240 FD sg?, scott?